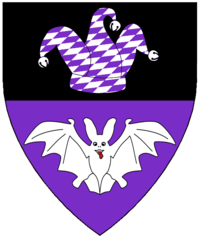 Per fess sable and purpure, a jester's cap lozengy bendwise sinister purpure and argent belled and a bat argent. 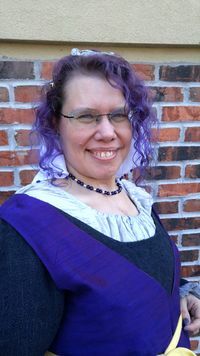 Baroness Aislinn Chiabach joined the Society in Anno Societatis XXVII (1992). She has spent most of her time in the East Kingdom with a brief stint in the Midrealm for mundane Grad School. She has lived in the college group of SCUM (Student Coalition for Universal Medievalism) in the Shire Coil Tuar, the Canton of Northpass, the Barony of Concordia of the Snows, the Shire of Rusted Woodlands, and currently resides in the Shire of Midland Vale. Nominally Aislinn is a 16th century Irishwoman living in Scotland. That being said, there are way to many time periods and regions with wonderful garments for her to be tied down to one area and time in the world. So Your Chancellor Minor, Now What? In case of an impending summons before a Court, please contact Lord Brochmail de Anglespur. This page was last edited on 21 April 2019, at 12:37.